Make your writing clear and concise, instantly, with WordRake. To start, select your text. Then click "rake." 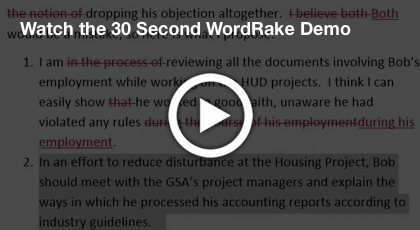 Watch WordRake ripple through your document, striking or replacing excess verbiage. Accept or reject suggestions individually. The only in-line editor designed for professional business writing. Declutters sentences & clarifies meaning. As quick and easy as a standard spell-check. Edit instantly without leaving Word or Outlook. Cut out rounds of revision by pre-editing. Write to the point. Every time. People can’t do what you want, if they don’t know what you mean. WordRake software takes you beyond good grammar and spelling to the heart of business writing: clear, concise, effective communication. In 30 seconds WordRake will show you the unnecessary words, the useless phrases, the dull sentences. You choose the edits you like. Write clearly. Be understood. Make things happen. Start with WordRake.